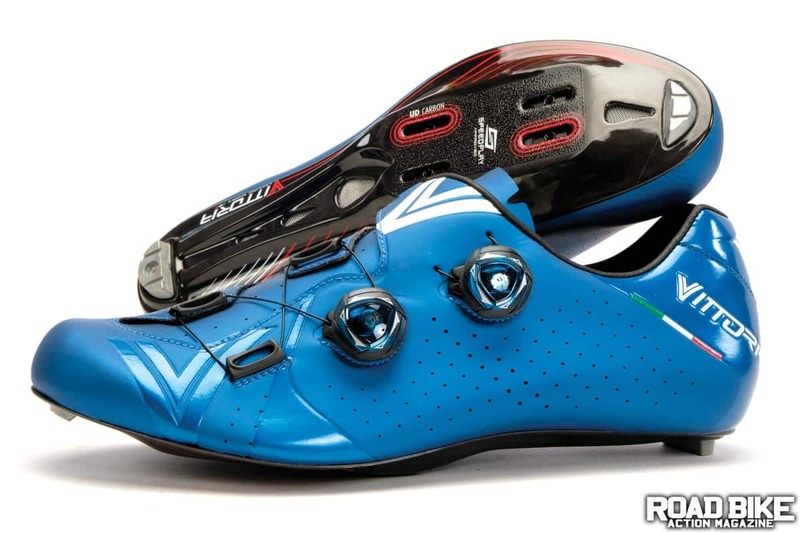 Shoes have always been a key touchpoint on the bike that, over the years, the Italians have proven to have a particular mastery of. Like so many Italian bike brands who track their roots to racing, Vittoria was created when Celestino Vercelli quit racing back in 1976 and decided to enter the shoe business. Since those early days, the brand has been worn by plenty of heavy hitters, including back-in-the-day Giro d’Italia/Tour de France heroes like Stephen Roche and Marco Pantani. Although not as big and prolific as some of their Italian counterparts, Vittoria has kept abreast of modern design and material trends while maintaining a firm embrace of custom builds. When it comes to cycling shoes, many companies offer their full-size run in one sole and a few select sizes in a wide version. Vittoria takes it to the next level with more fit options than we could fathom. Vittoria offers their shoes in sizes 38–48 and all come in half sizes. To further improve the fit, you can get different sizes for each foot if needed. Now, this seems like a lot, but there is more. Vittoria offers all sizes in three different sole widths—narrow, regular and wide. To add to the complexity, they also offered them in three different upper-volume sizes. This all leads to a shoe that can be custom-tailored to your exact needs without the price tag of a custom-tailored shoe. The Velar is Vittoria’s newest and most advanced shoe to date, offering quality workmanship and materials all from their family-run Italian factory. Yes, each shoe is meticulously created by hand. The Velar uses a new carbon sole that, in addition to providing increased stiffness and strength over the previous version, has also dropped 25 percent of its weight. This new sole is offered in the traditional three-bolt pattern (there is also a Speedplay-specific sole that uses their previous carbon sole). Like many others, Vittoria has also jumped on the BOA train, and the Velar’s retention relies on two IP1 dials with micro adjustments in both directions. These dials are mounted to the outside portion of the upper with the top dial wire being fed through a long portion of fabric that wraps over the top of the foot. The lower dial is laced through three guides, allowing for precise and even tension. The upper’s Microfibre material is supple but secure and supportive. There are laser-cut holes all over the upper and tongue to allow ventilation. Vittoria currently offers four stock colors, but teams and clubs can order custom colors in bulk. To add one more level of performance and precision fit, the insole has moldable arch support. Putting the Velar on is easy with the new BOA dials. Just pop them out for a full release and the shoe opens wide. When dialing in the tension, the long top strap with BOA guide applies an even and comfortable hold across the foot. This also holds the heel secure without the need for abrasive materials. The lower dial cinches the rest of the shoe, allowing for quick and easy adjustments as feet swell during a ride. The upper material is soft to the touch but holds its shape and form. The perforated holes allow excess heat to escape and minimize foot swelling. The vented sole is stiff and transfers power efficiently. The shoes feel light and well formed to the foot with no hot spots. The toe box is medium to wide on our non-custom fit. With such a stiff shoe we found ourselves wearing down the rubber heel of the sole. This is replaceable and very easy to do as long as you don’t wear the retaining bolt down too. All and all, this is one of the most comfortable shoes on the market, and that’s without us opting for all the custom offerings. The retention dials work great, and BOA will service them for free if there is ever a problem. The new carbon sole is light, thin and stiff. The only downside with Vittoria’s extensive custom program is that they don’t have a self-fitting guide for all of their available options. While their customer support is fantastic, it would be nice to have some sort of fit guide that customers could use to validate their selection of size, sole width and upper volume. The ability for teams to customize colors and even logos is something that only the pro’s were able to do until now. While their company footprint may not be huge, their product offerings certainly are. Vittoria takes service and quality to a new level for those looking for the most precise and custom fit available in a production product.